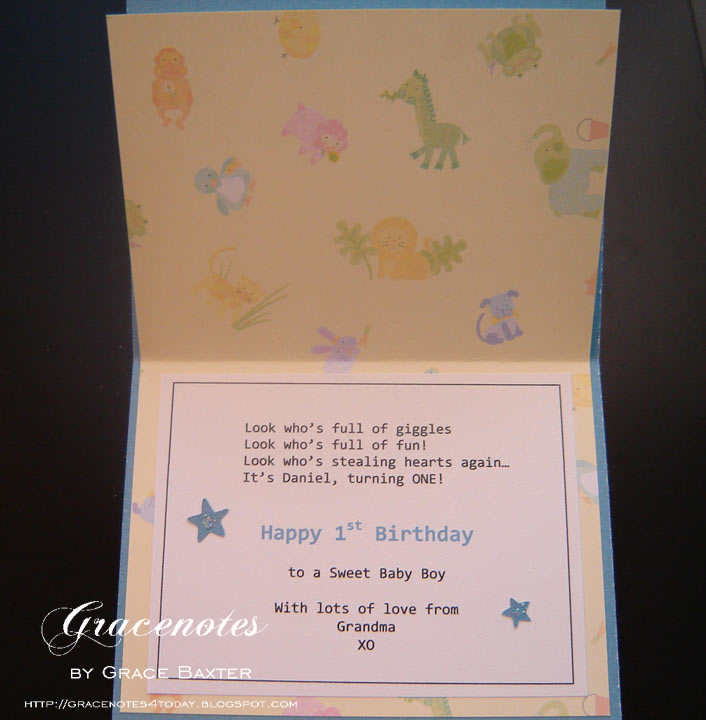 Grace Notes for Today: Happy 1st Birthday! It took me awhile to figure out a style. Should I go babyish? Or maybe more kiddish. I went with the soft hues of blue, white and yellow. The blue is a medium shade. The card is 5.5 x 4.25 inches, or the typical A2 size.I bought some beautiful shimmery and sheer ribbon, 1-1/2" wide. Front: The card base is blue. I embossed the baby quilt design and added stars in 2 different sizes. Each star has a dab of glitter paint in the middle for some sparkle. The finished "quilt" is layered onto pale yellow, and tiny heart brads secure the corners. At this stage I added the wide blue ribbon and adhered it to the back. The combined yellow/white panel was then glued to the blue card front. I created this "seal" style sentiment on the computer in PhotoShop. 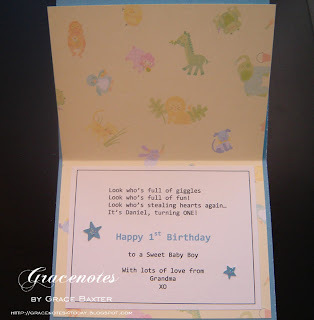 This took far too long, but then, this IS my FIRST grandchild's birthday card! It was a labour of love. 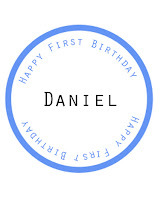 To complete the seal, I cut out the printed circle and layered it over a yellow scalloped circle, then that whole thing was adhered to a blue scalloped circle using pop dots. I also tucked in some white ribbon underneath. 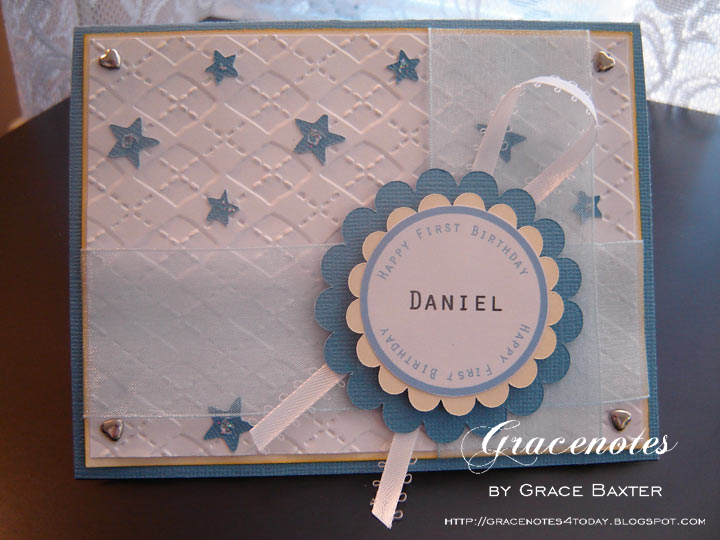 I have a ton of beautiful baby papers, all purchased for the purpose of making a baby album. I HAVE started the album, but cardmaking usually gets in the way of doing my scrapbooking. So back to the card. The inside needed some life. I decided to use a babyish animal print and secured it only on the bottom panel. Besides, the party's theme was "Zoo Animals" so this paper worked well. On top of that I centered the poem which was created on my computer. A couple of sparkly stars finished the inside. I think it's precious, don't you? 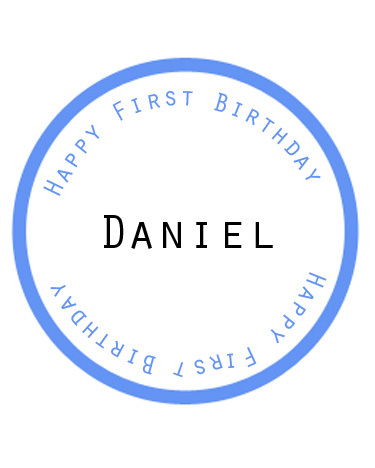 I hope this card will bring a smile to little Daniel's face when he is old enough to understand what it means.